Before I take you on the awesome journey on how RFID Tags can make your offline event create a buzz online, let me tell what the RFID technology actually is. Radio Frequency Identification (RFID) Tags are tiny chip-like devices that possess the capability to transmit their identity wirelessly. These tags can be as small as a grain of rice! Predominantly used for logistics to account for the movement of goods, these have now also found footing in the world of marketing. How Can It Make My Event Go Crazy Online? Hosting a cool event which you think people would like to talk about online but can’t because they are too busy in the event? RFID tags let your participants post updates and photos on a plethora of social networks without even taking out their laptops or cell phones! 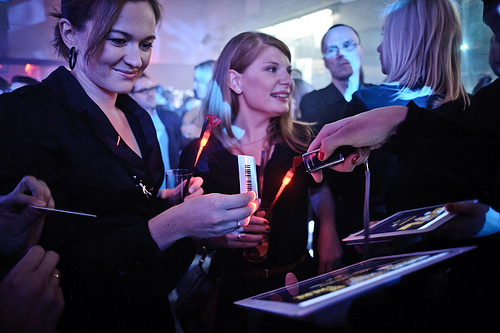 Let me explain to you the process of integrating RFID tags with your event. Giveaway the RFID tags (with a code) to your participants at the registration desk when they’re collecting their passes. The tags come in different form factors and they can easily gel with the theme of your event. Some of the most popular form factors are bracelets and ID cards. At the same registration desk, ask your participants to link their RFID tags with their social networks. All they have to do is to enter the code on RFID tag and login to their most favorite social network. The process is similar to how you login to various websites using your Facebook and Twitter account. Your participants have now linked their RFID tags with their social network. These touch points are everything that matters to your event. All your participant has to do is to swipe his/her bracelet or ID card and the touch point will update their account with a status. The secret lies in the strategic placements of these touch points. So if you are hosting a pool party, you can have touch points at the entrance of the pool, the bar, the food court, the dance floor and even at the exit. Now an average Facebook user has 262 friends, just imagine the buzz it generate if your event gets thousands of visitors who flash their RFID tags multiple times at various touch points. And guess what? Using cameras and nifty image editing tools at these touch points, you can also let your participants share photos realtime with their friends. Sounds cool, right? What do you think about this technology? Share your views in the comments below.